Training time should be a happy experience for you and your beagle. Beagles sometimes can be stubborn and get bored with training unless you make it FUN. Positive reenforcement, praise, and FOOD!! are the major motivators for a beagle. While working/training your beagle talk in happy cheerful tones and if you feel yourself getting aggravated-take a break. Keep the sessions short and try to always end on a positive note. Training your puppy should start as soon as you get home. Look for habits that your puppy already does and reenforce them. Example-puppy always come to you and sits. When a dog does this and it is what you want always praise "Goood .....". A cookie treat would at this time would also help to strengthen the signal that sit is a GOOD thing. Start saying "sit" as the beagle approaches you and when he sits give him a reward/praise. Soon the puppy will relate the word sit with " I've been good." This type of behavioral training can be used with any habit that you want to train your beagle to do on command. Just remember -KEEP IT FUN!!! If you find this site helpful, please help support this site by using this link for your Amazon purchases. 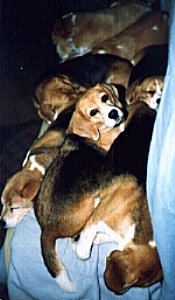 Please visit these links to learn more about training your beagle.